Sometimes we agree with Gary Pearce. We mistakenly thought that once NC House Speaker Thom Tillis had compared his hometown paper to "road kill" that maybe he had gotten it out of his system. Generally, when you start blaming press coverage for all your problems, you're on the way down as a politician, and it gets kind of embarrassing to be in the same precinct with such whining, or in the same state. But here he goes again. Over the weekend, Tillis sent out an e-mail message with this in the subject line: "For IMMEDIATE Release: My letter of Resignation." 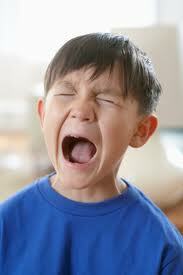 Another tantrum about the liberal media. The lies have become so vicious that the left-wing biased liberal media actually reported -- as if it were fact -- that Tillis called a 1 a.m. session of the House, without giving proper advanced notice, to hold a veto override vote.Tillis is absolutely right. This was the most scurrilous reporting ever seen in North Carolina. One could only hope that the public simply would not believe that a fair-minded leader such as Mr. Tillis, committed to the cause of legitimate efforts to improve the situation in North Carolina for all involved, could possibly conceive such a dead-of-night political maneuver to accomplish what could not be done in the light of day. A past-midnight session, called with scarcely an hour's notice, would afford no opportunity for the people of North Carolina to attend or to communicate their views to their elected representatives. It's unthinkable that a fair-minded leader such as Mr. Tillis, who wants nothing but what's best for the state, would ever initiate such legislative shenanigans. We can only blame an ultra-partisan elitist, biased media for concocting such a ridiculous and disingenuous mishmash of disinformation. Such conniving would of course comport with the "ruthless antics of the left," but Mr. Tillis and his followers have renounced such murky deeds, pledging nothing but openness and light. It is an insult to common decency and the principles of democracy to which Mr. Tillis has dedicated his life of public service, therefore, that the manipulative and deceitful liberal, anti-American unholy media has concocted this horrible smear campaign built around the absurd untruth of midnight machinations at the General Assembly. The good people of North Carolina should believe nothing of what they hear about the work of their legislature that does not issue directly from Mr. Tillis, who, it is well known, is always home in bed by 10 p.m.
"We Should Not Put Civil Rights Issues To a Popular Vote"
Why don't we have more Democrats who can speak this clearly and this directly? An article in the Carolina Review, "UNC's Conservative Journal," suggests that young Republicans are not unanimously eager to follow their theocratic elders over the cliff. 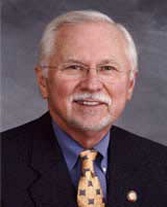 The author, Peter McClelland, argues that true conservatives ought to vote against that notorious bit of church-before-state constitutional over-reach known as "Amendment One," which would in effect hang a pink star around the necks of North Carolina's gay citizens. Amendment One appears "to threaten individual liberty," writes McClelland, "and exemplifies a government overstepping its bounds, which should trouble any conservative that prizes freedom and limited government." McClelland goes on at some length about this "abomination" (yes, he uses that word), and his outcry might be a warning shot that the old bigots warming those seats in the NC General Assembly have lost touch with their own offspring. Meanwhile ... the beat goes on, with another new Republican member of the General Assembly calling for the public hanging of abortion doctors. This morning at 8 a.m., the Watauga County Commission held a special called meeting to consider supporting the Tourism Development Authority's (TDA) plan and grant application for two river-access points on the New River at Pine Run Road and at the Green Valley Park. This special meeting of the Commission followed close on a special public hearing last night conducted by the TDA to gather public comment on the plan to improve recreation infrastructure in Watauga County. At the public hearing last night, we heard 95% support for the two river access developments. We would score that at 100% support, except that a couple of adjacent property-owners at the Pine Run Road access expressed some reservations -- worries -- about parking, obstructions to their properties, and the prospect of more litter ... all of which the TDA promised to deal with. And the property-owners appeared placated. At the Commission meeting this morning, with two commissioners absent, the remaining three commissioners voted unanimously to support and endorse the TDA grant application for some $75,000 in outside funding for the projects, with about $18,000 in "matching" funds from the TDA. Not really. Why these special called meetings? Because the new Republican majority on the County Commission insisted on them, and their coolness to continued development of recreation infrastructure in the county is a matter of record. As soon as the new majority took charge in December of 2010, they began quietly replacing members of the TDA board with people who vote consistently to shut down Watauga County for recreational development. Case in point: At their Nov. 15, 2011, meeting, with a couple of progressive votes on the TDA absent, the remaining members of the TDA board voted not to reauthorize TDA matching funds for another grant application to the NC Clean Water Management Trust Fund to acquire conservation easements for extending the greenway from Brookshire Park further down the New River toward Todd. The new appointees to the TDA Board didn't even want to apply for outside funding in the form of a grant. TDA matching funds: To date, the planners at TDA have been very successful at applying for and receiving over $900,000 in grants for infrastructure, most of which require some "cash match," usually a small fraction of the total, from the grantee (for example, the $18,000 "match" from the TDA reference above). These many successful grants are behind the development of the new Rocky Knob bike-and-hiking park, as well as many other improvements. The TDA raises its money from an occupancy tax on visitor lodging -- motels, beds-and-breakfast establishments, etc., so it's non-residents who have really funded the "match" for our recreation development. Little comes from the regular Watauga County budget. But that "little" is under assault, and the vision of improving the local economy by making Watauga County an outdoor recreation destination is imperiled. Though we passed through a gauntlet this morning, reappointments of key persons on the TDA board are upcoming, and the future is very much in doubt. Coming completely out of the blue, right at 9 a.m. this morning, was the rumor of an announcement that Gov. Beverly Perdue would not be running for reelection. That rumor was confirmed as fact about an hour or so later. The scramble among Democrats with state-wide ambitions was palpable, and we could hear through our Twitter feed the scraping of chairs on hardwood, the slamming of doors, the crashing of china all the way up here in Boone. And smell the sweat of ambition. The downside is pretty obvious: we're two weeks away from candidate filing with the top job in the state suddenly an open seat. Who gets trampled in the stampede? The upside is also perhaps pretty obvious: with a consistently unpopular governor out of the picture, the fall elections become a referendum on the Republican-dominated General Assembly rather than a referendum on Perdue, a shift in focus that might give Pat McCrory a pause or a little acid reflux, depending on how self-aware he is. There has to be some sort of Prophet of the Year plaque made up for presentation to Rep. Bill Faison, who's been saying for months that The Guv would step aside rather than run for reelection. 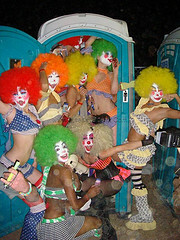 Most people poo-pooed that prediction, including Yours Truly, for which I now repent, apologize, and ask for forgiveness. Conspiracy Theory of the Day: Floating out there in Punditstan is the suggestion that it was the Obama White House that showed Gov. Perdue the door and that her exit from the scene increases Obama's chances of taking North Carolina again. That's clear-thinking, IMO. But the theory goes on to suggest that Charlotte Mayor Anthony Foxx has been groomed by the same White House to now run for governor, a theory that will have a mercifully short shelf-life, given that candidate filing starts on February 13. The Civitas Institute is coming to Boone for a training session for candidates, campaign workers, or anyone interested in politics and grassroots activism. The class will be held February 11 at the Daniel Boone Inn in Boone, NC from 9:00am - 4:00pm. The cost is $20.00 and includes lunch. Verified student ID price of $12 is underwritten by the Boone Tea Party. 1. 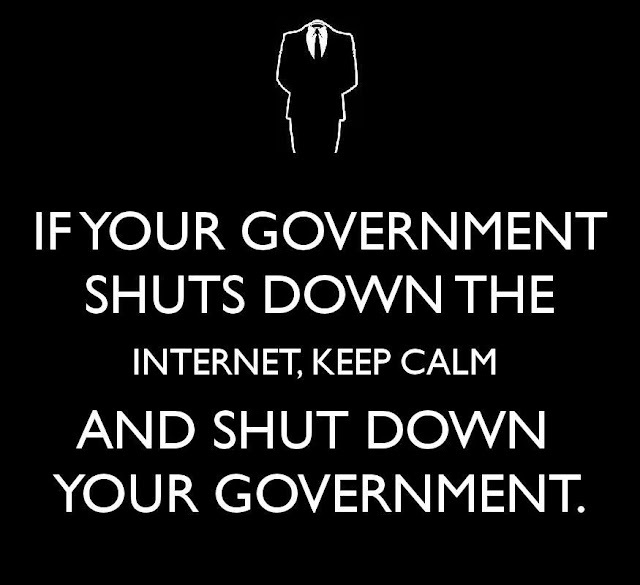 So Gov. Bev Perdue takes the gutsy action of calling on the NC General Assembly to raise sales taxes three-quarters of a penny to restore some of the teaching jobs lost under the budget rammed through by the new Republican majority, a budget which included letting a temporary 1-cent sales tax increase expire. 2. Republican Senate Pooh-bah Phil Berger has a conniption, partly, we suspect, over the fact that The Guv was gutsy. Who saw that coming? He challenges Perdue to a debate. Which she declined. Asked how much of this is about election-year politics, Berger said he’d been told by consultants that “The governor’s path to re-election is most likely going to be successful if she can pick a fight with the legislature. In my opinion, I think what you’re seeing, particularly over the last week or so, is her picking that fight." Let that sink in. Republican consultants have been telling Berger (and Thom Tillis, we would guess) that their long-awaited assumption of power in the state has made them very unpopular. More than just telling Berger, they were apparently warning him that The Guv could put herself on a track to reelection if she "picks a fight" with the unpopular Republican-dominated General Assembly. She does it, and Berger spills the beans. There are some Republican consultants experiencing face-palm time right now in Raleigh. Boone makes the Forbes list of fastest growing small towns in America. Yep. Those dern librul Democrats have ruined everything! Photo credit: Lonnie Webster. Photographed at the William J. Clinton Presidential Library, Little Rock, Ark. JUST HEARD OBAMA IS GOING TO IMPOSE A 40% TAX ON ASPIRIN BECAUSE IT'S WHITE AND IT WORKS. South Carolina ... too small to be a nation, too large to be an insane asylum. 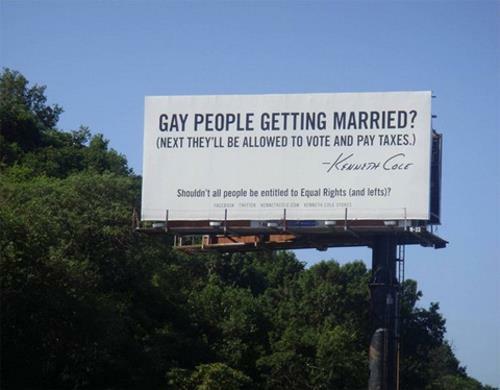 "The liberals will do whatever it takes to win in 2012, but North Carolina conservative can stop them. "North Carolina will be a battleground state like never before -- you owe it to yourself and your state to be organized and ready to win. "Battleground North Carolina is designed to energize, train, and equip citizens in our state to defeat liberal policies and liberal 'community organizers.' "
Yeah, when you're organizing, there's nothing more demon-izable than community organizers! Participating in the training will be pooh-bahs from Americans for the Prosperous, The Heritage Foundation, and the many tentacles of Art Pope's empire. A good hyperbolic immersion will be had by all. 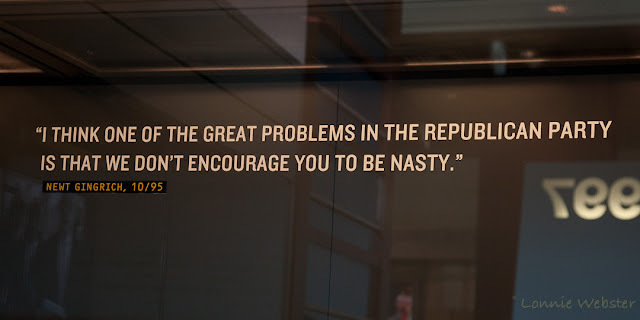 We're blessed this year, O my brethren, with Republican candidates for President who have become their own self-parodies, and I'm not actually talking about Newt's high-dudgeon at the indency of questioning his morals, which are obviously impeccable and beyond mere mortal inspection. Mitt Romney, channeling Arnold Stang pretending to be The Fonz. We nearly died laughing! Seems that Mr. Neff is fed up with evangelicals' being the Republicans' lapdogs. The Texas-ranch pharisees, who think they're almighty king-makers ordering their followers to bow down to Ole Frothy, are actually, "to use the old Soviet phrase, serving as 'useful idiots.' Christianity Today founder Billy Graham discovered this had happened to him. Out of an abundance of enthusiasm and good will, he tried to aid Richard Nixon in his campaign. Later, when Watergate transcripts revealed the true Nixon, Graham realized he had been used...."
...Our cry in the wilderness will only be heard when we look more like Jesus and less like political activists................it is time to repent! The God of righteousness is at the door and He is demanding our souls! The U.S. Supremes refused to accept the Forsyth County Commission's appeal of a U.S. 4th Circuit Court of Appeals ruling that the "in Jesus' name" prayers at the beginning of commission meetings violated the separation of church/state provision in the U.S. Constitution. Apparently, it takes a public clown to highlight the idiocy and corruption of our political process, the Citizens United, corporations-are-people, money-is-speech rabbit hole that our democracy disappeared down some time ago. Thank Gawd Stephen Colbert is willing to go where no actual politician will tread (except for Elizabeth Warren!). 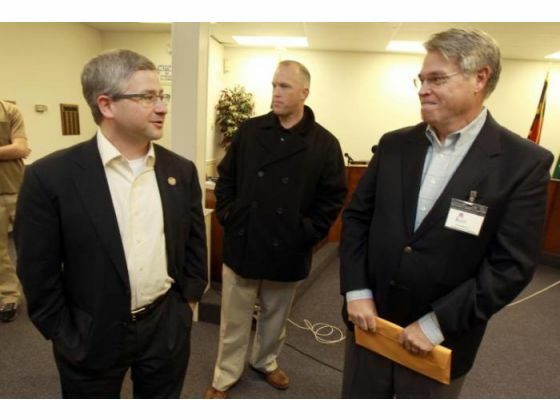 Congressman Patrick McHenry's Republican primary opponent this year, Ken Fortenberry, showed up at a supposed "townhall" meeting the Congressman was holding, and just by acting like a citizen and asking questions, Fortenberry brought the meeting to an abrupt ending. The published account is vague about which question McHenry refused to answer ... twice. [Gaston County Commissioner Chad] Brown said the meeting was held on “somewhat short notice.” Fortenberry said he found out about the meeting late Wednesday night. The Gazette did not receive notification of the meeting but was tipped off by a source. No other media was present. Sounds like a "townhall" that Virginia Foxx might engineer. You might want to pay attention to the conservative anger spilling out at Republican state Sen. Dan Soucek and Republican County Commissioner Vince Gable over last night's failure to stampede the Blowing Rock City Council into allowing concealed weapons at the Blowing Rock swimming pool and in city parks. It's all in a comment thread at The Watauga Conservative, where The Right goes to spew. They're mad at Soucek for being a gutless wonder. They're mad at Gable for being an ineffective blow-hard. 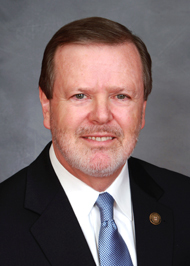 NC House member James W. Crawford was one of the Five Democratic Goobers who voted to override Gov. Perdue's veto of the education-killing Republican budget last year ... among other defections from the Democratic cause. House Republicans rewarded Crawford for his treasons by making him the only Democrat among the key budget-writers in the House. They also "double-bunked" him in their redistricting plan with another incumbent Democratic House member in House Dist. 2, Winkie Wilkins, so there will probably be a primary between the two of them (and perhaps one or two other Democrats). At the moment, polling in that district shows Wilkins easily beating Crawford. What's up next? You might expect Crawford to switch to Republican, especially as there is as yet no declared Republican candidate in Dist. 2. It's almost as though the Republican Party were keeping the slot open specifically for Crawford. 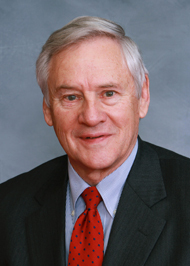 Denton, NC, Republican Sen. Stan Bingham is one of the last Republicans in the NC General Assembly who might justifiably receive the label of "moderate." For example, he originally voted against the cruel and unusual anti-abortion bill passed last year, the so-called "Women's Right to Know" act (part of which has already been struck down by a federal judge). Bingham was the only Republican in the Senate to vote against the law. At the time of the bill's passage over his objections, he told reporter Mark Binker: “I’ve got four daughters and I have never imposed on them. They are bright, smart young women and I trust the decisions they make. I’ve got one’s a doctor, one’s a lawyer and two engineers,” Bingham said, adding that he raised his daughters to think for themselves. But after Gov. Perdue vetoed that odious law, Bingham "left the building" just as the veto-override vote was coming up. Taking a powder at that particular time looked like cowardice, or at least a failure of nerve in the face of the theocrats who've taken over the NC Republican Party. So he earned zero points for ducking that vote from either his own party or from the opposition Democrats. On the anti-gay amendment, there was some speculation that Bingham might vote against that bill to put discriminatory language into the NC Constitution (based on some past statements and actions of his on non-discrimination in employment). But Bingham voted for marriage discrimination against gays, along with all the rest of his caucus. Even more surprising, Bingham did not bother to correct the lie when he spoke to the reporter from the Lexington Dispatch. It's almost as though he's given up fighting for principle against the far right forces that are taking his party down the rabbit hole. Yesterday afternoon, Wake County Judge Paul Gessner signed a temporary restraining order stopping enactment of the Republican vendetta against the North Carolina Association of Educators (NCAE). Gessner agreed that the association had demonstrated it would suffer irreparable harm if the law is enacted, according to Associated Press reporter Gary D. Robertson. Judge Gessner said that NCAE “has shown a likelihood of success on the merits” of its claim that the process violated the state constitution. "A hearing for a preliminary injunction to block the enactment while the complaint is tried in court will be scheduled in the next 10 days, said Bob Orr, a Raleigh attorney representing the association." Bob Orr? Former Republican justice on the NC Supreme Court, noted conservative constitutionalist, and until recently an employee of Art Pope's at the Pope-funded N.C. Institute for Constitutional Law (NCICL). That Bob Orr? Laura Leslie at WRAL has put together an informative piece interviewing a variety of legal experts debating the merits of Bob Orr's case for the NCAE. Most interesting are the opinions of Orr's former colleagues at the NCICL, which prompts all sorts of questions about why Mr. Orr left the Art Pope group that is now strongly disagreeing with his new clients. Greensboro News&Record reporter Mark Binker says that Orr was asked during a conference call "about taking up a case closely associated with Democrats when he has run in conservative circles for so long. 'The state constitution does not mention Democrat or Republican. It doesn't mention liberal or conservative. It is what it is and says what it says,' Orr said." We believe that having Robert Orr as lead counsel in their face-off with Thom Tillis and the Republicans in the NC House is the NCAE's equivalent of playing political hardball right back at the politicians who decided last year that they would play political hardball with the state's teachers. Former NC House member Cullie Tarleton announced this morning that he would be taking on incumbent Republican Jonathan Jordan in a rematch this November. Even Jordan's supporters are hard pressed to think of anything he's done for his district. He's mainly marched off the right side of the earth, in blind obedience to former employer Art Pope and the self-destructive Raleigh/Charlotte leadership of his party. 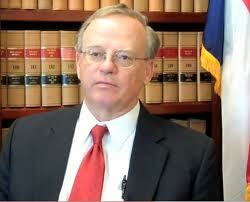 Must read column by Greensboro News&Record political reporter Mark Binker. When did a politician ever improve his position by declaring war on the Fourth Estate for reporting his behavior? Tillis acting like Zsa Zsa Gabor ... canceling newspaper subscriptions, throwing tantrums, making his mascara run. Another candidate has filed with the FEC to run in a Democratic primary in the North Carolina 5th Congressional District, Elisabeth Motsinger, a school board member in Forsyth County. Treva Johnson was the first announced candidate. In 2008 the NCAE PAC gave money to Dale Folwell, Robert Grady, the Republican House Majority Committee, and the Committee to Elect Republican Women to name a few spotted at first glance. Early Thursday morning, while the new Republican majority in the North Carolina House were carrying out their vendetta against the North Carolina Association of Educators and overriding Gov. Perdue's veto of their law singling out the NCAE for bill-of-attainder-style punishment, the Twitterverse hashtag #NCGA (for "North Carolina General Assembly") spiked up dramatically. Even at 1 a.m., it's hard these days to get away with political murder without a lot of people noticing. The above chart tells the story. It's hard to know how many thousands of Twitter subscribers were eventually touched by the message, "Republicans going nuts, punishing the teachers union," and perhaps it tends to be more politicos and political reporters who follow that hashtag, but a round-up of editorials across the state today suggests that the key people heard the news, loud and clear. The illegitimate power-grab has already cost the NC GOP dearly, and it ain't even beginning to be over. NC House Speaker Thom Tillis sez that a 1 a.m. session for which there was no public notice nor any chance for the public to participate or to even know what's going on is totally, wholly, and righteously "transparent." "It's a rose if I call it a rose." 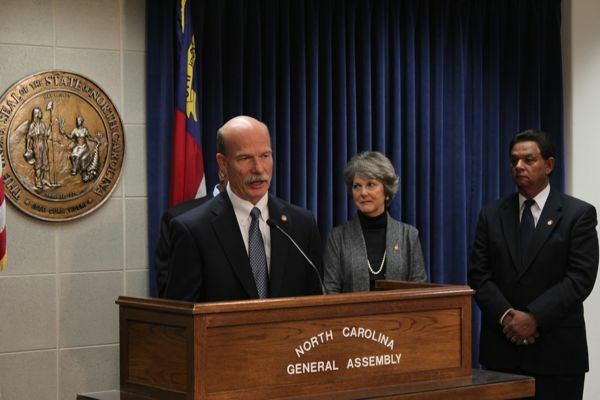 Approaching 1 a.m. this morning, the new Republican leadership in the NC House rammed through an override of a Bev Perdue veto in order to single out and punish the North Carolina Association of Educators (NCAE). Two House Democrats helped the Republicans in their project. Associations of state workers routinely have their dues deducted from their state pay checks. The State Employees Association (SEANC) operates this way. So does the NCAE, at least they did until the dead-of-night vendetta against them played out in Raleigh early this morning. Ah, the high-minded statesmanship of the morally superior! Mark Binker today has written the best and most complete accounting of the midnight shenanigans in Raleigh. The reason Gov. Perdue is calling the House’s action “unconstitutional” this morning is because the state’s founding document says that a veto-override session can only take up the veto in question, and Gov. Perdue called the Honorables back to Raleigh to consider only her veto of their repeal of the Racial Justice Act ... which, incidentally, they failed to achieve, throwing in the towel around 7 p.m. last night. The Republicans adjourned the session but called for a whole new session to convene at 12:45 a.m. this morning to take up new items. They clearly also intended to override the governor’s veto of the fracking bill and the voter photo ID law, but they couldn’t gather the votes. They had to settle for just crippling the teachers’ association. 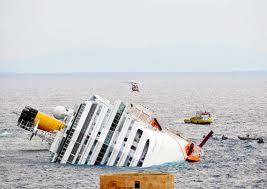 So ... it could have been worse, O my brethren. Incidentally, the two Democrats who helped the Republicans out in attacking the teachers: Reps. William Brisson of Dublin and Jim Crawford of Oxford, both members in good standing of The Five Goobers. 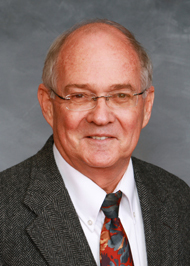 NC House Rep. Bill Faison made some show of announcing today that he had loaned his campaign $500,000, considerably more than he would need for a successful reelection campaign for his House seat. Refuses to say what he plans to do with that pile, though he's already promised he wouldn't run a primary against Bev Perdue. He's also been less than polite in calling on Perdue to step aside, so we've gotten some mixed messages. Exile on Jones St. ventures that a gubernatorial primary is "looking more likely." Which perhaps only proves that it's not just a quarter of Republican voters in Iowa who have a death wish. Jehovah is getting cagey with the Rev. Robertson, because though He has shown the Reverend who the next U.S. President is going to be, He doesn't want Pat to spill those beans, which seems, actually, kind of a disservice here on the eve of the Iowa caucuses, since knowing the will of God could greatly simplify the choices tonight. Robertson on the 700 Club today: "I think He showed me the next president, but I’m not supposed to talk about that, so I’ll leave you in the dark — probably just as well — I think I’ll know who it will be." The verbatim message from God that Robertson read on his TV show makes it appear that God has been reading Chris Hedges but is actually pretty late to that party, predicting economic collapse, like, a couple of years behind the curve. Perhaps God has spent so much time chatting with Pat Robertson that he sorta kinda missed the biggest story of 2008. The Honorables of the NC General Assembly are right now strapping on their red rubber noses and heading to Raleigh for a veto-override session tomorrow, trying to overturn Gov. Perdue's "NO" to their rewriting of the Racial Justice Act, which mainly removed "justice" from the law. We like Mark Binker's explanation for why it's unlikely that the Clown College will take up any other veto overrides -- like voter photo IDs -- and we're prepared to trust that he's right. 'Course, ya never know fer sure, do ya?